William Brackner, who was born in Beeston in August 1893, was one of three brothers to make the "Supreme Sacrifice" during the Great War. His father George lived at 9 Broughton Street, Beeston, Notts2; his mother Sara Ann having died before the sons enlisted in the army. George, the brothers' father, was born in Blidworth in about 1857 and their mother was born Sarah Ann Burdett, the daughter of a well known local bricklayer. They had married in Nottingham in August 18873. Sarah had been previously married (to Thomas Thorpe) and widowed and brought two children to her new marriage. By the time of the 1901 census the family were living at 8 Broughton Street, Beeston4 with George senior working as a bricklayer for the Midland Railway. The couple had by then, had seven children of their own - six of them boys - all of them of school age except the oldest, their only daughter Alice Lavinia who was working as a lace mender. Also present was the children's half sister, Mary Thorpe and her baby daughter. William attended Church Street School before starting work as a lace draughtsman, He was a member of the Primitive Methodist Church on Wollaton Road and became a keen member of the Boys Brigade. When war broke out in August 1914, he was one of the party of young men of the Beeston Lads Club who enlisted together, joining the queue at the recruiting centre one ahead of his younger brother George5. Like his two brothers, he joined the Sherwood Foresters. 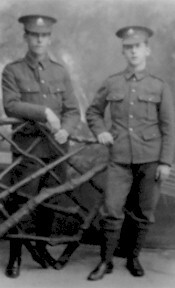 William is on the left in the photograph; his brother George is on the right. We are fortunate that the Army Service Record for William Brackner survived the destruction caused during a German bombing raid on the War Office in London in September 1940 which has meant that well over half of the records of those who fought in World War 1 are lost to us - and many that do survive were bady damaged. This surviving record for William gives an insight into his enlistment, medical condition, service history, promotions and - finally - his death in action. It tells, for instance, that, at the time he was recruited he weighed 127lbs, his height was 5 feet 9inches, he had a fresh complexion, grey eyes, brown hair, and a circular scar on his the back of his neck, and a mole on the inside of his left thigh. He was then 21 years old and 26 days old. Prior to July 1915 when he joined the Mediterranean Expeditionary Force, he was engaged in training in England and must have shown early promise as he was promoted to Lance Corporal in November 1914. His service record up to this point had been similar to that of his brother George with both brothers taking part in the Gallipoli fighting. But this was now to change; while his brother survived the fighting only to die shortly afterwards of illness, William was badly wounded on 9th August 1915 and was invalided home. He was admitted to the Duchess of Connaught's Roman Catholic Canadian Hospital at Clivedon on the 7th September 1915. By November 1915 he had recovered from his wounds and was then posted to the 3rd Battalion, and on 9th May 1916 he was posted to the 1st Battalion joining "B" Company, 5 Platoon in France. On 27 December 1916 he was promoted to Corporal. On the 14th April 1917 he was wounded yet again and, by 21st November, he was back in England suffering from "Shell Shock". Less than a month later he was back at the front. His promotion to Sergeant came on 27 March 1918. Sergeant William Brackner was, at last, to make the Supreme Sacrifice, when he was declared as missing believed killed in action when the 1st Battalion Sherwood Foresters were retiring on Montagne De Guyencourt during the first day of the Aisne/Chemin Des Dames battle which lasted from the 27th May - 6th June 1918. It was one o'clock in the morning of the 27th May, punctual to the predicted time, that the German bombardment was loosed. The whole of IX Corps front and many back areas - railheads, ammunition dumps and the like - were drenched with gas shell. Outpost lines were assailed in addition by trench mortars of every calibre, and the Battle Zone received the terrible bombardment from artillery of all natures which has just been so graphically described. British artillery positions were also violently attacked with gas shell and H.E. and had area shoots carried out upon them, with the result that by 6am most of the British guns north of the river were out of action. He was one of 221 men from the Sherwoods who died during the first few days of the battle but it was not until 1st October 1918 that official notification of his was made by the Red Cross Enquiry; this lists Sergeant Brackner as missing believed killed in action on 21st May 1918. His Service Record contains details of information notified in an German list of dead, advising that his paybook had been discovered amongst the fallen who had been buried by the Bouvancourt/Pevy Road, west of Rheims. William died just four days before his elder brother John who also enlisted in the Sherwood Foresters later joining the Cheshire Regiment. Neither brothers' bodies were found and both are commemorated on the Soissons Memorial. Barbara Cartland's father was killed in the same battle; his name is also on the Soissons Memorial to the Missing. He was the commanding officier of the 1st Worcestershire Regiment. "All Platoon commanders will remain with their platoons and ensure that the trenches are manned immediately the bombardment lifts. Send short situation wire every half hour. No short bombardment can possibly cut our wire and if sentries are alert it cannot be cut by hand. If they try it shoot the devils." This message was found pinned on the wall of the battalion HQ dug out by Colonel Buckles father, who visited the spot after the Armistice. He found his son's grave close to the entrance and, on each side of the grave, a German had been buried. Those who knew Colonel Buckle felt sure he would fight to the finish and never surrender. 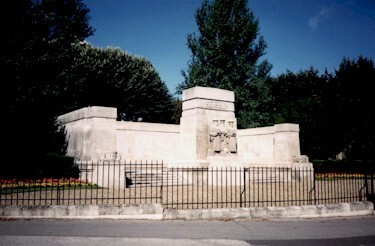 1The photograph of Soissons Memorial to the "Missing" is from the Commonwealth War Graves Commission website (http://www.cwgc.org). 2This address is that recorded on the CWGC records. Their address in 1901 was 8 Broughton Street, Beeston. At the time of William's enlistment and when he joined the Boys Brigade in 1909, the family was living at 15 Clinton Street, Beeston. 3They married on 7 August 1887 at Nottingham St Anns. 4The family can be found on the 1901 census in Piece 3153, Folio 38. The children are listed as James (12), Harry (10), John W (8), William (7), George (6), Arthur (3) and Alice (14). Arthur died in 1905. Harry and Alice Lavinia (then Mrs Poyser) settled in the United States, probably before the war. 5William and George's Service Numbers were 13907 and 13908 respectively. Their older brother John W Brackner enlisted on another occasion.